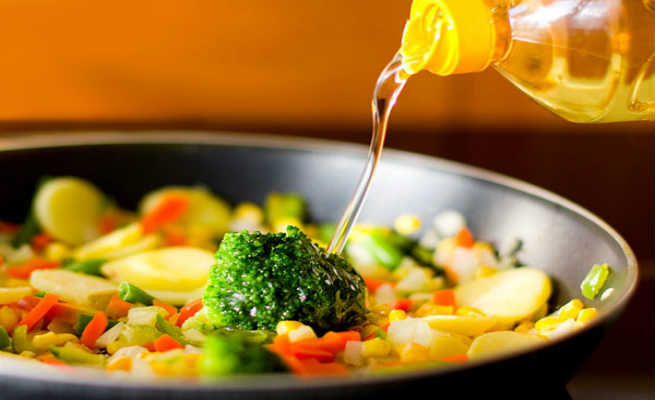 Almost everything that you cook on a daily basis has cooking oil in it – be it in a simple tempering for your vegetables, your breakfast or deep fried snacks. So it becomes very important to use the right cooking oil. When choosing a cooking oil, make sure that it is rich in antioxidants, so as to control the free radicals in the body. Free radicals cause cells oxidation which leads to cell degeneration and can cause coronary problems and blocked arteries. A cooking oil with high amount of antioxidants will help fight all those effects. Make sure the mono unsaturated fatty acids (MUFA) composition in the oil is high since it helps in reducing the levels of bad cholesterol and triglycerides in the body. Your oil is an important factor that determines your heart health. The supermarket aisles are flooded with different kinds of oils, each claiming to be better than the other. If you are confused about the qualities of one oil over another, we tell you here the options you have while choosing the right cooking oil. The oil that is extracted from groundnuts is widely consumed through the country. Groundnut oil has a nutty fragrance and taste. It is offered by many brands in the refined form and is suitable for tempering, grilling and frying. However , it is an acquired taste and not favored by many. Any health freak would swear by olive oil being the healthiest oil there could be. It is rich in mono unsaturated fatty acids and helps keep the heart healthy. But extra virgin olive oil, which is considered the best kind, is fit only for Mediterranean cuisine. The high temperature cooking in India cannot be done with Extra Virgin Olive Oil. The oil is widely used in East and North India and has a characteristic flavor that is sharp and pungent. It has a high proportion of MUFA and is suitable for all kinds of cooking. However, it has erucic acid and consuming it in large quantities can be dangerous to health. This is the most popular kind of cooking oil. It is rich in Poly Unsaturated Fatty Acids which lowers both good and bad cholesterol. Since it also reduces good cholesterol levels, it is best to be used on alternate days or when mixed with another oil. This is the oil that is extracted from the bran of the rice and has many nutritional benefits. It is rich in MUFA, contains natural vitamin E and antioxidants and is stable at very high temperatures too. Safflower Oil is a colorless and flavorless oil that is similar to sunflower oil in nutritional qualities. It has a high smoking point and is rich in Vitamin E and Omega 6 fatty acids. It helps strengthening cell membranes in the body. Confused again with so many oil options? Every kind of oil has something good to offer, so National Institute of Nutrition recommends that oil combinations are the way to get the best mix of fatty acids. There are many blended oils that are available in the market which you can pick to get all the goodness from the oil. Of the oils, you could pick Saffola Total which is a multi seed oil with a synergistic blend of safflower and rice bran oil – providing you the goodness of two oils in one. Nutritionists have put their stamp of approval on the Saffola Total oil saying that it is the right mix of fatty acids that is best for the heart. Not just that, the Saffola Total oil has twice the antioxidant power than olive oil. Which means it helps scavenge the free radicals in the body and fights their cell degenerative activities, taking care of keeping your heart healthy. The oil withstands the high temperatures of Indian cooking and prevents the formation of free radicals in the oil despite the heat. What’s more, it also has the added advantage of Losorb Technology which ensures that even when you are making your favorite deep fried snack, it gets absorbed 10% less than other oils like canola and sunflower oil. As soon as absorbed oil is less, the fat consumed also reduces. Isn’t that all you want from your oil – that it be packed with antioxidants, gives you a healthy heart and has low absorption.